Flickr user whiteforge has a great collection of forged and antique tools, as you may remember from previous TM posts. This set of adjustable wrenches he posted caught my eye, since I’ve never seen any quite like them. 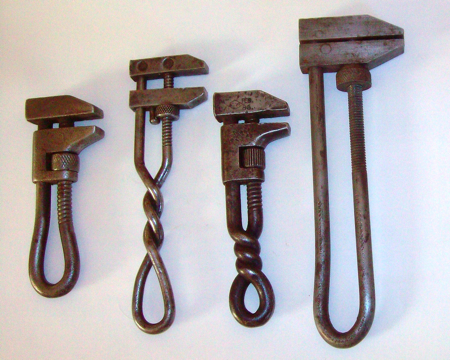 Oldtools in the UK has some cool-looking twisted handle wrenches that are similar, but not identical. Have any Toolmongers out there forged your own hand tools? It’s act of labor and love, and pretty humbling to think that people used to forge their own tools as the norm — not to mention every nail they used to build a house. I’ve heard that centuries ago, families would burn down their houses before moving just to collect all the hand-forged nails to build the next house. I don’t know if this is really true, but I wouldn’t blame folks for taking their nails with them. If you’ve forged your own tools, or if you possess any hand-forged tools, do they still get regular use, or do they get a protected place in the tool retirement box? I’ve heard of shipwrecks being burned for their hardware. I have looked over all these pix and am amazed at the great work here and the OLD tools. I am trying to identfy my late husbands many vintage tools. Trying to clean off the rust and grime and store them whee they won’t rust again! So I am looking at MANY sites with old tools but yours is the most interesting!! My father has a lot of vintage tools and I would love to compare it too with what you have presented but my father doesn’t entrust his tools just like that. Actually, they are in a locked storeroom. Meaning he has the only access to that room. That is how important his tools to him. Yes, I forge my own wood turning and carving tools. It is a very gratifying process, and one which provides a sense of continuity with those earlier craftsmen and craftswomen. With regard to the story of houses being burned to retrieve the nails holding it together, I’ve always been tempted to dismiss it as legend. However, in his work “Early American Ironwork,” Albert Sonn does in fact list documents attesting to the practise in Colonial America. I believe Sonn listed court or property records of the day showing that certain homeowners had burned their houses to retrieve nails before moving on to new land. It’s really mind boggling to think that the value of the nails in the house exceeded the structure’s then-current market value! hi all , i was looking over internet to find a wrenche like the one i find while i ws digging in the basement , my house was build in 1826 and i find the exact same one as the 3rd from the left , but mine is very rusty and nearly felt apart . i was looking to get an idea of the age of that tool . anyone have an idea ? . Hi, we found one exactly like the first wrench in the picture while combining and I plan to clean it up and keep it for a keepsake. I am curious as to how old it might be. Any ideas? I have the Wrench on the left . Any idea as to its age and value? Would like to know how to get the prices of the antique tools you show on your site regarding vintage hand forged wrenches. There is little antique value in tools other than what some sentimental fool such as myself will pay for them for interest sake. I have ratchet wrenches from 1908 that look and work as they did the day they were made with not much real value. Also I have a complete set of Plomb (not Plumb) wrenches from prior to 1932. Plomb had to change their name do to an infringement suit by Plumb and hence forth called the company The Professional Tool Company. A lot to put on a wrench so it was just shortened to Proto. I have old Williams, Snap-On, and Herbrand. and not one of them worth what I need to retire on but don’t ask me to part with any of them or you’ll find out what they’re worth to me. I am amazed at the little value people place on old tools. I like to think that they just can’t picture how our tools evolved to a point where they can have anything instantly. If they had to hand make something, maybe they would see a little more of their value.